This is currently a very hot topic. With the incredible fast rise of availability of technology devices, in almost everyone’s hands, this question is on the minds of parents, teachers, psychologists, and scientists…could too much time spent be having a negative effect on my child or is it a necessary way to ‘keep up’ and be on par with what everyone else’s children are doing. I have had unsubstantiated opinions based on my common sense so I decided to research and see what studies and research have found. Interestingly enough, in the early 1960’s, the television set was becoming popular and available to more and more families. At this time, the Federal Communications called the onset of TV as the beginning of a ‘vast wasteland’. Fast forward to today, screen time is not limited to the TV. It also includes Smart phones, tablets, and laptops. The internet and handheld devices especially, have opened the door of opportunity to apps, games, videos, advertisers and millions of dollars of profit. Can’t really blame these companies. The demand is being met by the desire to communicate 24/7, literally in the palm of your hand. So with this huge fast progression, it is wise to weigh the benefits and the downside to the progress of technology, with an open mind. Without a doubt, how amazing is it to pick up a 3×5 inch box and talk to someone on the other side of the earth?? It is also very convenient to have access to unlimited information on any possible subject by simply typing GOGGLE or asking SIRI. Another rewarding feature is ‘face timing’ with family members. Without a doubt, we are able to stay connected in a way that was never know before. So what could possibly be the downside? If this was the extent of how technology is being used, there would not be a downside. Some not so desirable symptoms and behaviors have been witnessed by parents, teachers, and pediatricians that has led to the question as to how much screen time is too much. Ages 2 to 5 years- 1 hour of only high quality programs intended to teach. The American Academy of Pediatrics did not make these recommendations without extensive research. What was found in many children who exceeded these limits were quite a few adverse effects. These outcomes range from Infants to teenagers. From Dr. Jane Healy’s book, Different Learners, she emphatically states that screens have taken control of our young people’s minds. They become reactive vs reasoning beings. She states, “Four areas of concern relating to overuse of technology have emerged that particularly impact learning difficulties. They are attention, language development, “people” skills, and problem solving/imaginative thinking.” What IF this is true, even partially? Should we as parents be concerned? How about us as part of this society and the future of the next generation? Should we be concerned? The answer is a resounding YES. It is important to understand that overuse leads to an over dependence that is more than a desire for ‘fun’. Instead there are changes that occur in the brain and especially in the brain of a young person whose brain is not fully developed. 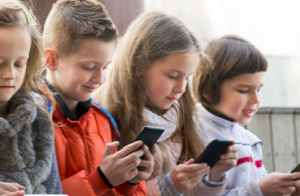 One that is easy to understand is the FACT that when a child spends more than 30 minutes per day on a screen device, this causes rapid activity of dopamine production that leads to the body constantly wanting more of that ‘feel good’ hormone. When stopped, causes a sudden drop off of dopamine that results in bad moods, agitation, anger, and tantrums. This same result is seen also in adults in several types of addictions. Dopamine production becomes dependent on the behavior that initially stimulated it. The healthy production becomes dependent on the stimulus that then becomes an addiction. Technology, screens, Smartphone, and tablets are not going away. There are suggestions that we as parents, grandparents, teachers, or anyone else that has influence on young people can do. Not a parent? Share these ideas with someone that is. We are in this together. Place computers/devices in common areas of the home where use can be supervised. Install monitoring devices on the device child uses most. Do parents have the right to rob child’s privacy? Yes, until the child’s frontal cortex is fully developed and able to make decisions on their own. Unfortunately, science says that age is around 25. Limit use to 30-60 minutes daily during the week (over 30 minutes consistently is when addiction begins). Ban devices from bedroom. Allowing this open window to the internet is like dropping your child off downtown then picking them up in a few days and see what has happened. No electronic games on the same device they are using to read from. Too tempting for a child to go from reading to game playing. Secure wireless routers so child does not know the password and able to give to their friends. When finished use, must sign out. Smart phone are not for children or young teens. Walk your talk. Use same guidelines for own use as given to child. Set the example. If a child sees you reading a book, they are more likely to also read a book. Don’t get angry when child expresses discontent with these limits. Be calm but be a parent, not a friend. Child’s job to ask, your job to manage. Create and be consistent about Tech Free Zones. In addition to the bedroom, mentioned above, include also during meals, in restaurants, and even in the car, with the exception of long car rides. These times are for conversation and getting to know each other better. There are few uninterrupted opportunities in our busy, overscheduled world. The home is meant to be a safe haven where happy and sad experiences can be talked about. Have you ever had a child walk into you in a store because they were playing on a phone? How often have you observed a family with children as young as 1 year, with their focus completely on an ipad or with earbuds on, watching a movie? I will always go up to a table in a restaurant where the family is tech free talking to each other and congratulate them. They are very appreciative of the compliment. Keep in mind, the use of devices is a privilege not a right. In the home, only allowed when chores and homework is done. Set the rules and consistently stick to them. A side note…my research found the following information: teenage girls and boys tend to express themselves differently. Boys will physically fight when mad. Girls get mean. A preteen and teenage girl has no reason to have a social media account. This is where most bullying is found among girls. Think twice about allowing this opportunity. Go for walks or to a playground. Bake cookies for a shut in. Story telling CDs are valuable ways to increase reading comprehension and imagination. In addition to substituting activities, it may help to know what several studies have linked the reason why video games have hooked so many young people, to the point of becoming an obsession. Rather than assuming kids are lazy and defiant, an article from Psychology Today written by Dr. Nir Eyal states that gaming satisfies 3 basic human needs…competence, autonomy, and relatedness. Competence being the need for growth, progression, achievement, and mastery, as found in a challenging video game. Autonomy being the need for freedom of control over the choice to call the shots in a game. Relatedness being the need to feel like they matter to others and others matter to them, being part of a gaming community. It has been suggested that game creators know this and design them is a way that satisfies these needs. Why do you think it has been said the Silicon Valley parents limit extensively their children using technology for entertainment? Of course, there is no way we can agree that video games are a good substitution for other ways to get these needs met. No matter how well a game is designed, it can’t come close to the deep satisfaction that real life and real human connection can provide. No game can give a child the feeling of competence that comes from accomplishing a difficult task on their own. No social media site can give a child a sense of relatedness, safety, and warmth that comes from an adult that loves them unconditionally and takes the time to tell them so. When kids see their parents are not only trying to stop their fun but are instead helping them keep things in the right perspective and in the right proportion, they become allies rather than enemies. It is time to become intentional and do the right thing for our children. A colleague of mine, Victoria Proody, Occupational Therapist for children, whom I admire very much for the work she is doing to educate parents as to the damage that can be done, not regulating children’s screen time. She did an experiment with her 10 year old son. There was no technology Monday through Friday and only 1 hour a day on weekends. Initially he resisted. He complained, he whined, he stomped around saying how bored he was. After the first week, he began to look for other things to do with his time. His mom suggested he cook dinner for the family, one night. Little had he known, he began to love cooking, finding new recipes, helping his mom make the grocery list of needed ingredients. Victoria interviewed him after several weeks and he actually thanked his mom for taking away technology because he found something else he loved more. A recent update about her son…he is starting a cooking class for his classmates. That emerged from his mother enforcing his use of technology. It will not be easy initially. Do what these guideline suggest. Don’t give up and give in. I’m sure, no one ever told you being a parent was going to be easy. You will be glad when you know you are providing the guidance your child needs and the reward as you watch them grow and expand in new ways! Contact me to receive your FREE EQ Assessment.